Each April 15 produces a spate of polls on the public support or resistance to paying taxes. Gallup records that, after three decades of 60 percent or more of Americans say taxes were too high, the G.W. Bush era of tax cuts early in this century appeared to help drop the number to about half of the public. And, it nearly equals those who say taxes were about right (only a sliver of 3% of Americans say taxes are too low). This year, 48 percent say taxes are too high and 45 percent about right. Attitudes about taxes correspond to tax levels, or at least awareness of levels, from popular media, political discussion and actually paying taxes, especially income. The tax revolt so often predicted in 2009 has not started for most people. But one bit of news for those looking for signs that the Tea Party may have legs is that Gallup reports 63 percent of Americans expect their taxes to go up. Even a near majority of Democrats believe it’s likely. 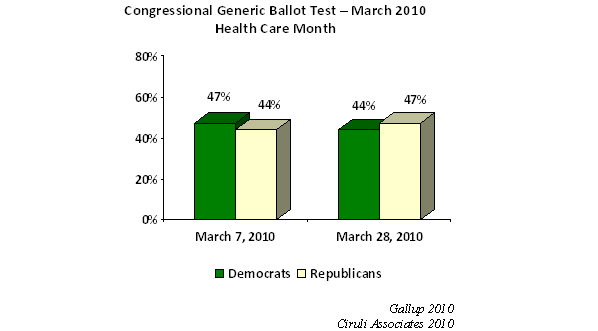 Health Care - Who's Ahead? It is still not clear if the Democrats maintain or if Republicans will gain political ground from the March 21 health care vote. Early polls appear to indicate that, while the bill and its approval is still not favored by a majority of the public, at least Democrats have increased the level of enthusiasm for voting among their core supporters. And, of course, failure to pass was not an option. President Obama, Speak Pelosi and the Party’s reputation in general would have been devastated. Both parties are fighting to define the post passage environment. Democrats are using Obama speeches and advertising (Congresswoman Markey is on TV in the Denver metro area) and Republicans are benefiting from Sarah Palin and the law suit challenges from the Republican attorneys general. 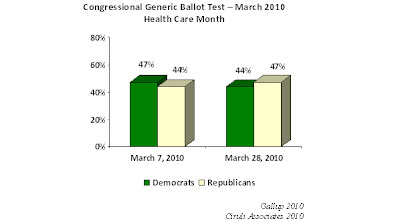 Gallup reports that, as of March 28, the Republicans appear to have surged ahead of Democrats in the generic ballot question, the first time in March. As Gallup points out, Republicans only need to be close to Democrats to pick up congressional seats due to their history of stronger turnout. Years they lead in the congressional ballot test, they pick up seats – 1950, 2002 and 1994 when they won the House with a 54-seat pick up.